You know that clichéd way of describing chaos theory? 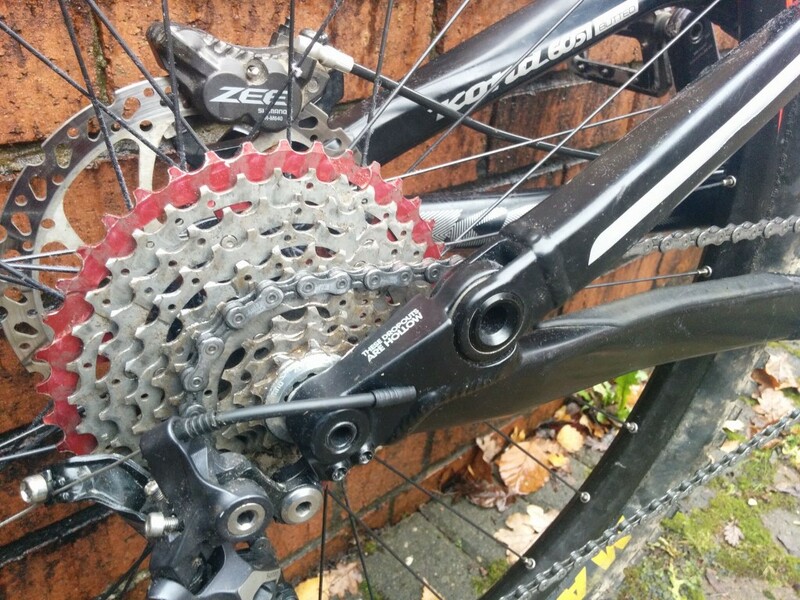 When a butterfly flaps its wings in the Amazonian rain forest it causes a bloke in England to buy another new bike? OK, I may have paraphrased a bit there – but sometimes events can have unforeseen knock-on effects. Like when I bought a Giant Reign recently and realised that I’d been riding bikes that were too short for me for years. After a few outings on the Giant I knew there was no point keeping my other MTBs – it was a bit like when I got wide handlebars on one bike and it suddenly felt weird and wrong riding the others. Anyway, I got it into my head that a short-travel 29er with “fun” geometry (as opposed to XC race angles) could be just the ticket for me. I’d kind of worked out that a Transition Smuggler was my ideal bike on paper, but have you seen how much they go for secondhand? I couldn’t afford a used one, let alone a new one – but I did happen to see a Kona Process 111 frame, fork and stem going for a more reasonable price on Pinkbike. The only thing was that it was a large and I’m about 5ft 8in (and a half!). Look how long this motherflipper is! And check out that standover! But I was thinking that the lengthy 462mm reach might actually be OK with my short legs and long torso. So even though the Kona didn’t really float my boat looks-wise and had a reputation for being a bit hefty – I thought it’d be an economical way of trying out this whole nu-skool 29er thing. Fast forward a few weeks and a lot of faffing shortening my Pike to 120mm and getting the BB swapped from Sram to Shimano – and the Process was ready to go. Riding it round the driveway it did feel long. I described my first impression as feeling like I was riding a hang glider – so if you picture that position in your mind you’ll get the idea. I was honestly surprised how quickly I got used to this though – and the stretched out position was nice and efficient for my relatively flat shakedown ride on some super-local trails. It’s been hellishly wet and muddy round here lately and the first ride saw no shortage of slop, so that initial ride was a bit slow and slippy. One thing I noticed though was that I wasn’t falling off as much as I should have been – thanks to that long front end. I had one memorable moment when the front wheel slipped to the right as I pumped for take-off on the lip of a little jump. Flying sideways through the air I instinctively tried to bring it back but was fully expecting to highside it and take a tumble in the mud. That’s not what happened though. Instead the bike landed diagonally, but with my momentum still travelling forwards – and I somehow managed to stay upright as it fishtailed down the slippery landing slope. The credit for this dramatic save must totally go to the Process rather than the rider – and it had a similarly bigger-than-usual margin for error in other sketchy situations. That top tube looks even longer from behind. There’s no denying that the Process is heavier than most bikes I’ve owned – I’d estimate 33lbs with pedals and a mid-to-high-end build. 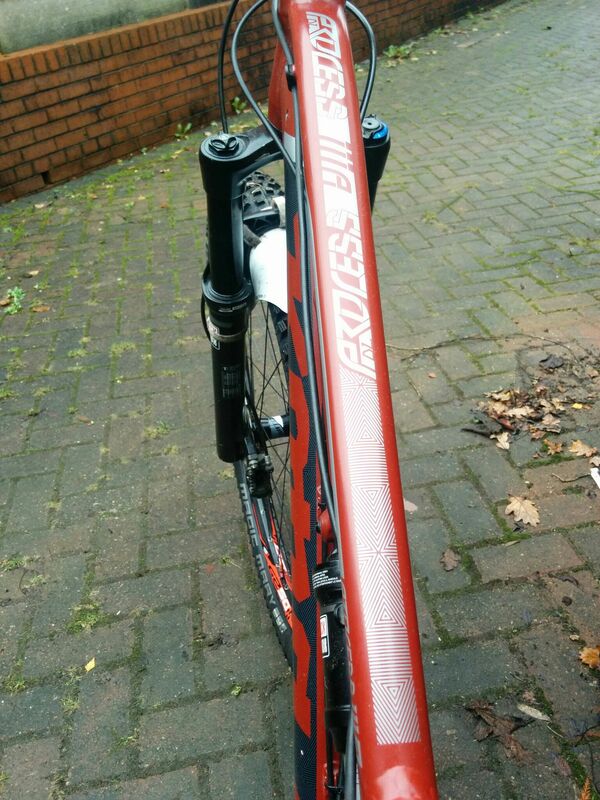 So it feels like a right old lump when you have to lift it up, but in the saddle it pedals pretty well actually. Yes 160mm bikes pedal well these days, but the short travel on the Process and the stiff chassis provide excellent power transfer. I did read that the Process uses similar tubing to Kona’s Operator DH bike on the rear stays and I can believe that. 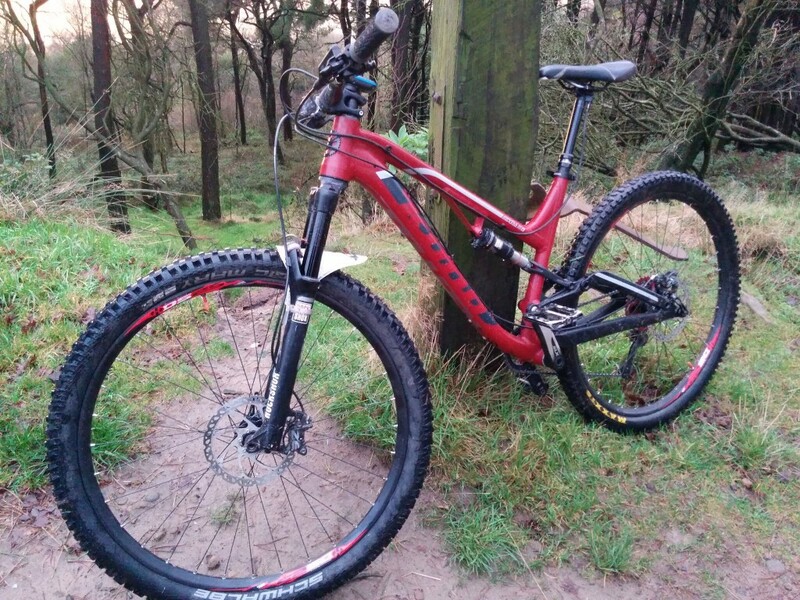 I’ve taken the bike on most of my usual trails at Rivington and I was honestly astonished with the confidence and abilities of the stiff, short-travel frame. Only my Reign and the full DH bikes I used to own could compete with the Process in the stiffness stakes – and it flies over rough ground with a confidence and predictability that I absolutely did not expect from a bike with only 111mm of travel at the rear. Let’s have a closer look at those chunky rear dropouts, shall we? And to be honest, I think I’ve got the rear shock set up a bit too hard, so I’ve not even had 100mm of travel according to the O ring (assuming full travel uses the full shaft). On the subject of the rear suspension, it doesn’t have any noticeable quirks or characteristics at all really. 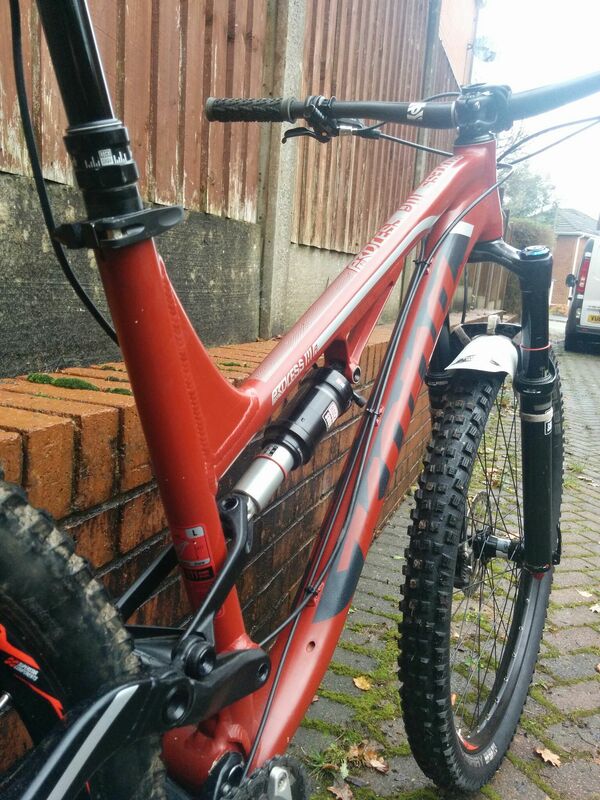 The frame has the top-end Rock Shox Monarch RT3 from a couple of years ago and I really can’t fault it. The firm setting is very firm but doesn’t interfere with climbing on rough ground, the open setting just lets the four bar suspension do its job nicely and the medium setting is in between the two (and I haven’t really worked out where I’d want to use it yet). When I’ve forgotten to firm the suspension for a tarmac climb it has made very little difference. Maybe it was blind luck, or maybe I’m getting the hang of setting bikes up – but the Process has just felt spot-on from the start. The bar is in the right place, the 120mm fork feels perfect and I’m glad I avoided the temptation to go for a longer air shaft. I thought I might need to go a touch shorter than the 40mm stem it came with – but it seems to be perfect. I wasn’t a fan of the Kona’s looks on the PC screen, but in the metal it’s very handsome. Whereas the Reign felt normal but noticeably more stable than my previous bikes, the Process has needed a bit of a change of riding style. The first technical descent I tackled on it saw me lose the front wheel on a steep, twisty and muddy bit of trail, hitting a tree. I reckon this is because I was instinctively putting my weight back – cutting traction on the front. Since then I’ve been trying to stay more central on the bike and things have been fine, I’d say I feel more in control on steep trails than on any bike I’ve ridden before. On fast singletrack the bike is a missile, especially when there’s a bit of a downward gradient. And I’ve found myself riding ruts faster and with less anxiety than at any time before – even though conditions for all my riding on the Process so far have been filthy. So are there any negatives then? Well even with a planned wheel upgrade it’s never going to be the lightest bike. This isn’t really a problem for the riding I plan to do on it – but it would be a heavy cross to bear if I was heading off on hike-a-bike epics with it. I’m still not a fan of press-fit BBs and I’m surprised Kona went for one. The bike is clearly such a labour of love, designed with a clear and original vision for real-life riding rather than a market category. It’s such a “rider’s bike” that I’d have thought a threaded BB shell would be an obvious choice. But I have found recent press-fit BBs very reliable, so this could fairly be considered as nit-picking for the sake of it. I’ve still got to try the bike on woodsy singletrack in the dry and at a trail centre – and I’m really looking forward to doing to, expecting good things. 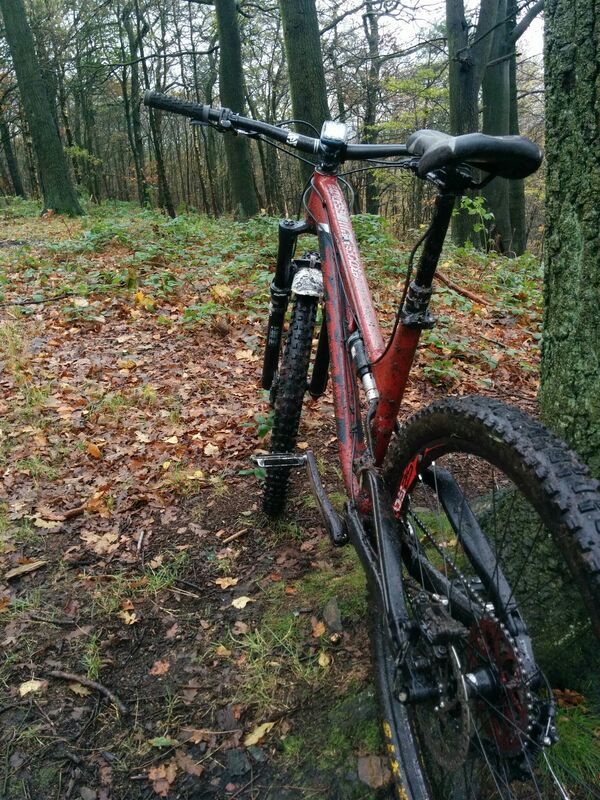 You’ll probably have to wait six months for the trails to dry out before I’m back with a full review though. Pretty patterns on the top tube. If you’ve found this post useful or interesting, please follow the blog on social media via the icons at the top of the page.